Are your hands feeling the toll of the harsh winter? Dryness, cracking, roughness and sometimes bleeding are all symptoms that leave hands vulnerable and tender. If you're experiencing any of these issues, why not give your hands some needed TLC with these wonderful hydrating gloves by Bliss. In 20 minutes you can have hydrated hands with these self-activating gel lined gloves. The gloves can be use alone, or paired with your favorite hand cream for an extra boost of moisture. One set of gloves are good for up to 50 applications. Price $52.00 Available at Bliss or a Bliss spa near you. L'Occitane. The small travel size is perfect for on the go. 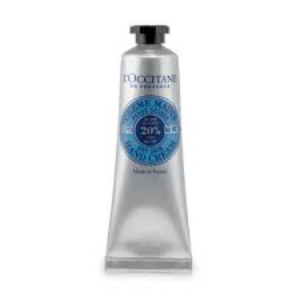 This rich hand cream contains 20% Shea Butter for quick hydration without feeling oily, yet leaves hands soft and supple. 1 oz tube $12.00, 5.2 oz $28. Available at L'Occitane and in a Sephora store near you.